The Lahore Literary Festival (LLF) is undoubtedly one of the most highly awaited events which not only quenches the thirst for knowledge of the city’s literati but also caters to their love of books, debates, dialogues and futuristic conversations on a host of issues. 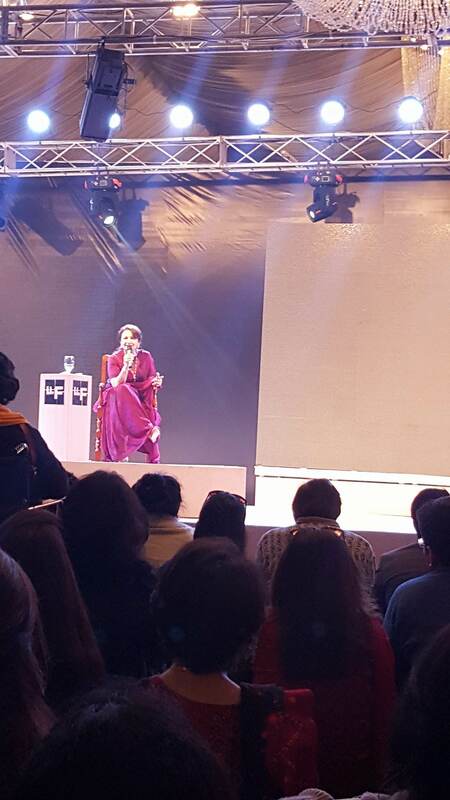 This year the event kick started after a day’s delay, with the session “Safar – In conversation with Sharmila Tagore”. Tagore, who is in her early seventies looked ravishing in a maroon sari and greeted the guests with a humble namestae. The session revolved around the journey of the star, from starting her acting career with Bengali movies in 1964 to her marriage and kids, with commentary by Hameed Haroon and clips from the past from some of Sharmila’s best works. “I started acting in movies before I even saw one,” says Sharmila during the session. In the hour-long chat, she shared how a teenager from a close-knit family made it big in the film industries of India – both the Hindi and the Bengali cinema. Her father had instantly said yes to director Satyajit Ray’s offer for acting because he knew of his international acclaim. “I was brought up in a very Bengali yet westernised household. Everyone lived in my grandfather’s house. One of my uncles was from the Congress party, while a cousin was a communist. Hence the table debates were endless,” Tagore said. 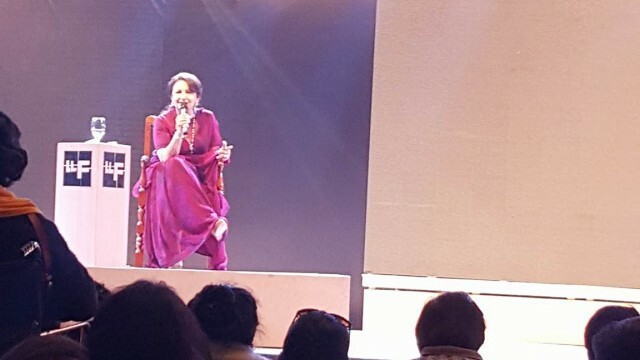 The glimpse into the life of one of the most adored heroines of the Indian cinema wielded a heavy punch as the star-struck people of Lahore listened to the session on the edge of their seats. Her journey through the Indian cinema has been hard but very fruitful, she says. Back in her day, heroines weren’t supposed to dance, smile or drink anything other than coke. They were always chaperoned and wore only white, she told a rapt audience of about 400. In such a culture, Tagore became the first Indian actress to wear a two-piece for the Filmfare cover – this was before her movie An Evening in Paris was released, for which she received a lot of flak. Talking about her work in the Censor Board of India, Tagore felt that it was really hard to cut and certify someone’s artwork. Also, she felt that the public was the best judge of these films. She feels that while the industry has definitely evolved, it still has a long way to go, which will happen with time. Tagore said she had been blessed to be part of many dynamic and groundbreaking movies and believed that the process should continue. “Women are usually the first target of religious orthodoxies,” she emphasised during the session. On her love life with Mansoor Ali Khan Patuadi, she said that her feelings of love weren’t any different from the feelings normal people have but she made it happen in harder times when people didn’t have phones or the internet. “It was a time we were crazy for cricket and cricketers,” Sharmila adds. Pataudi introduced her to Ghazals, she told the audience. One day, Pataudi told her that he had written a couplet for her. Overwhelmed, she showed it off to her director. “I told him Pataudi wrote this for me, Dil-e-Nadan tujhae hua kya hai…and he said, ‘Idiot this is Ghalib!’.” The audience laughed heartily. He also learnt the phrase, “Get ready in 15 minutes or else I leave,” in Bengali to taunt her. This year Lahore could have lost another beloved festival due to security issues, but somehow the government managed to provide security on February 20 and 21, but not on February 19. The event which was previously slated to be held at Al-Hamra was shifted to Avari hotel. “I find it amusing that we are secure just adjacent to the original venue,” said Aasia, a teenager. Sharmila’s session was held in the Marquee of Avari Hotel. “I think this hall could hold about a thousand people, but the seats were put up for only a few hundred,” said Abraiz, a Tagore fan who had to sit on the floor for the entire session. The session was coupled with short clips from her movies to describe the actor’s journey. “I feel we should have heard her talk more, the sound system was really bad turning off now and then. Also, I thought the clips took a lot of time,” said Mrs Waqas, a socialite. “I really enjoyed the session, it was very inspiring. A woman, if she sets her mind to something, can achieve anything,” Komal, a student, told Pakistan Today after the session concluded.